here I encounter a problem on an environment ESX5.5 I have a VM under SBS2011 with veeam backup and replication installed, I make a backup to my synology. a VM estimated at 600GB, the first backup takes 12h, it's normal. Please check the statistics. Go to the Job run in the History (left menue at bottom). Then look at the job run. Click on the VM. Then on the right side you should see specific information for the VM. There it should say something along the line "Using Change Block Tracking" or it says can not use change block tracking. My guess is that for what ever reason something is wrong with change block tracking and we use snap ans scan backup mode (fallback) which read 100% of the data again and detect the changes. You didn't click on the VM. Tonight again the backup is very long 12% in 1:30. Can you please provide the screenshot as requested. here is the picture of the job is good for you? THis is strange. By default you should see the information here that CBT is used. 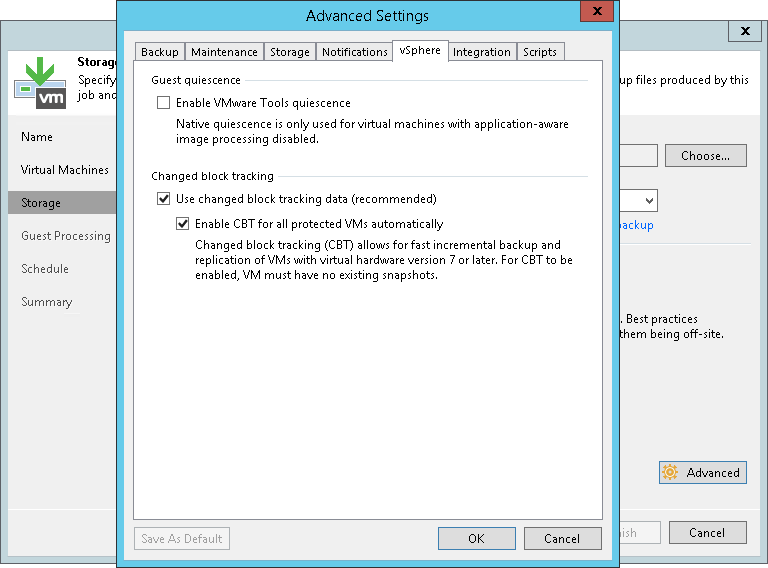 Can you please double check that withint the backup job - storage - Advanced - VMware the change block tracking and the second setting within cbt is enabled. If this is the case, please open a Veeam support case and upload logs. Our support can potentially identify why CBT is not working or was never enabled. It is important that the VM has no VMware Snapshot present so that Veeam can enable CBT. Maybe this is the issue? Based on the screenshots provided, CBT was used actually - see [CBT] sign. Anyway, I recommend you reaching our support team to speed up investigation process. Kindly, submit a ticket with our support team and let them confirm your environment. Thanks!